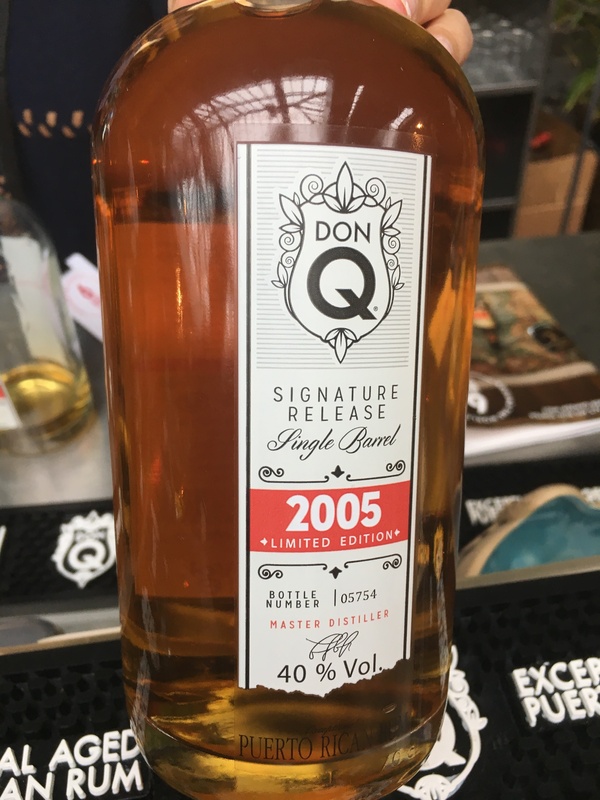 Have you found an online vendor selling Don Q 2005 Limited Edition? I tried the new Don Q 2015 at Rumfest London 2016, it's nice and spicy - just like I've come to expect from Don Q. It's a little less harsh than some of the other from this line and easy to sip on. Slightly sour tangy finish and lingers with an oily feel. Definitely not a bad rum, but also not super unique either. I'm not a fan of this rum, as it has too much bourbon for my liking, and it's too dry. To me it's just a bourbon rum. Too much bourbon and not enough traditional rum flavor. A lot of similarities to the old Cockspur 12, but not many to Mount Gay XO. Dry, cinnamon spicy, with a touch of wood. I prefer the 2007 vintage since it has more flavour... But 2005 is a very nice whiskey blend rum as well. I taste the wood, bananas and vanilla. A good choice for a long-time bourbon drinker like ne. Delší dobu jsem se odhodlával k ochutnání. Výsledek je poměrně dobrý rum, ke každodení konzumaci. Není to typicky stařený / aged rum jak by většina čekala. Suší rum, výraznější chuť. Bez přidaného cukru. I was hesitant to buy this one based on many reviews comparing it to bourbon.Yes, it is a dry rum with no added sugar, but it is nothing at all like a bourbon. With me hating Don Q Gran Anejo, this was another barrier to keep me from trying this one. So I told myself that it's only money and priced at $36 US, so I brought this puppy home. I was anticipating a 7 rating. The aroma is uncharred oak. The taste is pure rum with very little flavor because it is dry. The after taste is where it shines. My goodness! It is uncharred oak combined with flavors of pure rum with no after burn. That after taste just lingers. This is the third rum that I tried today and lucky me, all three rated as an 8! (I don't count Don Q Gold that I rated early this morning as a 4 because the price difference is huge...I hate the term price point because it sounds like toast points). Initially, a nice flavor. Not a strong oak or molasses flavor. Went from a 5.5 to 6.5 on my scale when I finally caught the molasses. Had just a little but tasted nice, definately one to go get myself! Last drink for tonight was a Don Q Signature Release Single Barrel 2005 edition. Hard to find bottle. Very light golden color. Woody notes to the nose. Very much whisky like to the throat. Not a typical flavorful aged rum in my books, but will be very good for a whisky lover. I like this one. Maybe a little to dry for my taste but overall a nice (not too) sweet tasting rum. The rum has a beautiful color. Not too sweet, spicy with a hint of oak. Very pleasant nose that only got better with a few drops of water. Very nicely don Don Q. Most of their line contains rums meant for mixing and that is it but their vintage single barrel rum product offers a really nice rum to be enjoyed straight out of the bottle. Catch it if you can because they are selling out fast. At only 3000 bottles distributed in the US, believe, they won't last as the 2007 vintage is already available. Priced between $38-$50, it isn't a cheap rum by any stretch of the imagination, but well worth it in my opinion. Great for rum collectors to add to their collection as well as those who seek a complex and smooth rum to enjoy time and time again! Un vrai 10 ans, un prix ridiculement bas pour ce rhum qui va à coup sûr devenir collector ! I had first tried the 2007 vintage and got a hold of this one later, it's much different overall. This is lighter in color and tastes a bit younger IMO but that may not be the case. It's not ur typical light sweet alcohol background that you would expect from Don Q, there is a bit more bite and the finish is like a Bajan rum with a banana/coconut tropical fruit like flavor. It reminds me of Doorly's 8 year. The 2007 in comparison is more like a Spanish style rum with prominent oak tannins in the way of Pampero Anniversario RE or even Ron Del Barrilito. This is good natural rum. Update: still good and fruity woth some apple like flavor, there is some kind of funk i don't love tho. Velice průměrný rum. Nemá žádnou výraznou chuť. Neurazí, ale nenadchne. Pleasant aroma and finish, but not the best I've had. This rum doesn't have any bells and whistles, is just a very elegant and smooth rum, just the way it should be. Not my usual full flavoured taste but a nice little drop nonetheless, light golden in appearance and a smooth finish but then disappointingly seems to leave as soon as it gets going. A nice 'session' rum though if there is such a thing? Didn't think much of this rum until I read the review of it on TheFatRumPirate his website and decided to order a bottle. Am happy that I did as its a nicely balanced, light single cask rum which is very much Bajan style despite being from Puerto Rico. Normally I prefer a bit heavier rums, but as an every day sipper this does a good job. Don Q, keep it up! Not a bad rum but is to light for me. Medium flavor and short aftertaste.